Confirm a Kill have been dealing with unwanted pests in Nottingham for over 25 years. Our team of specialists work with both domestic and business customers. As well as removing pests we can also offer advice on prevention. For commercial customers, our pest control service contracts are a popular, low-cost way, of keeping your premises pest free. As members of both PROMPT and NPTA, all work we carry out is fully guaranteed providing you with total peace of mind. With all our pest control services, including Wasp Nest Removal, we, first of all, perform a no-obligation assessment. Once we understand the scale of the issue, we will provide a quote to complete the required work which comes with our price match promise. This guarantees that should you find a cheaper quote elsewhere for a like for like service we will happily match it. Wasps are an important insect controlling predator in the UK environment. They eat flies, aphids, caterpillars and other invertebrates. As wasps can be more aggressive than bees at certain times of the year, they can be an unpopular insect. However, it may surprise you that like bees, wasps also pollinate. So, they are just as useful to have in our gardens and countryside. 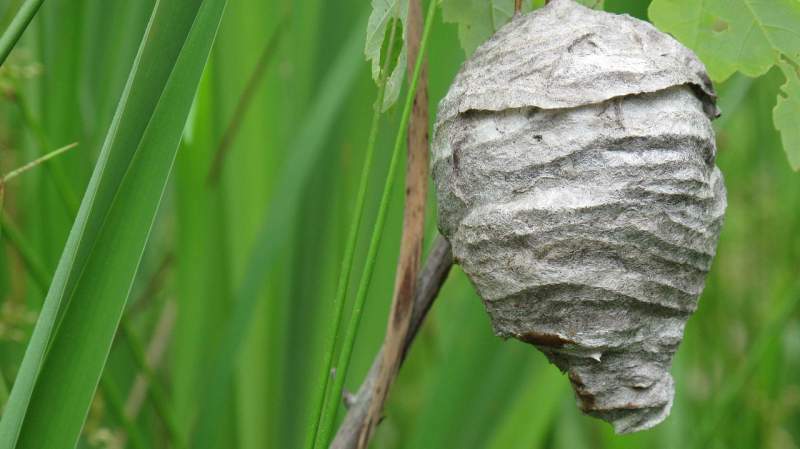 Wasp nests can be a problem, especially if you are allergic to the venom in the sting. As nest colonies grow larger, more worker wasps search for food and if threatened they can become aggressive. Worker wasps are predators who will feed on insects and human food. In the height of summer, the workers are more desperate to provide richer food at a faster rate. If you have a wasp nest in your property or garden, you need to be very careful if you want to remove it. We always recommend that the general public should never attempt wasp nest removal themselves. When removing a wasp nest, it’s far better and safer to allow a professional and qualified pest control technician to deal with the problem for you. A pest control expert will have all the necessary protective equipment and experience to ensure the nest is dealt with safely. To successfully treat and remove the threat from a wasp nest we use an insecticidal dust that is sprayed directly into the nest. The treatment will agitate the wasps slightly, and activity will slightly increase. Within a few hours most, if not all, of the wasps will be dead. Treatments for wasps are fully guaranteed. Should there be any activity 48 hours after the treatment then the wasp’s nest will be treated again free of charge? There are thousands of different wasp species in the world. Most of these species are solitary so will rarely be noticed as a pest. The two main types of wasps found in the UK that live in colonies which form large nests are the Common Wasp and the German Wasp. Each wasp species has three different types of insect known as the caste. The three castes found in each species are the queen, male and worker. Queen’s are the largest of the three and are only ever seen outside in the spring. Worker wasps are the caste most often seen during summer and early autumn. The Common Wasp is (at its name suggests) the most likely to be seen throughout the UK. This species build their nests in almost all environments from woodland to urban areas. The Common wasp is often found in man-made structures, and this is where the nests can cause a problem. 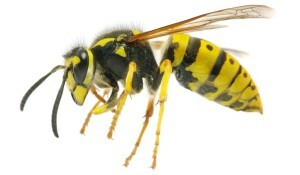 The German Wasp is the other species regularly found in the UK. Their appearance is very similar to the Common Wasp. This species normally like to nest in the soil below ground. Nests are also found in man-made structures such as attics. The queen wasp hibernates in the winter and emerges in spring when the weather starts getting warmer. The queen will hunt around for a location for her nest. Sometimes wasps will nest in the same area each year, but each year a new nest will be built. The nest is made using wood and wasp saliva which creates a paper-like material. The location of the nest will either be a humanmade structure like building eaves or something natural like a tree or a bush. Wasps are thought to prefer timbers like cedar and oak as building materials to construct their nests. It could be due to these timbers containing a scent that attracts the queen. Wasps have also been known to use loft insulation to build their nests which can help them camouflage the build. The queen will begin building the nest with a cylindrical column which she covers with a chemical to repel ants. Around this central column, she builds cells where she will lay her eggs. Grubs develop from the eggs the queen has laid. These grubs grow into the female worker wasps who manage all the hunting and feeding duties for the growing colony. Once the nest is built, and worker wasps are hatched the queen stays in the nest to continue egg production. As the weather warms up in the summer, the wasp colony grows. Workers help to build a larger nest, and the queen continues to hatch more eggs. In the peak of a warm summer, a nest can contain up to 5000 wasps. Towards the end of summer, the queen starts to produce the next generation of queens and males. As the next generation matures they leave the nest to mate with wasps from other colonies. When the weather gets colder in late autumn, the male wasps die, and the queens go into hibernation. Worker wasps are the insect that can cause humans the most problems. The workers need to provide food for the growing colony larva. When the colony is young, there are lots of larvae who reward the adult workers with sugary secretions at feeding time. At the end of the summer, the larva is undergoing metamorphosis so don’t need feeding. This means that the workers aren’t getting their sugar hit so they must look elsewhere. It’s during this period when wasps are most likely to become a nuisance to humans as they are attracted to our sweet food and drinks. The main problem caused by wasps is when they sting. Wasps sting when they feel threatened. When a wasp is in distress, they emit a pheromone that sends nearby colony members into a defensive, stinging frenzy. If you run the wasps will chase you. Unlike bees, wasps can sting repeatedly, but their stings inject less venom than bees. The human reaction to a wasp sting is a result of our own bodies defences and not a reaction to the wasp sting. A small percentage of people are allergic to wasp venom which can cause anaphylactic shock. As wasps are defensive insects, especially around their nests it’s far safer to seek professional advice about wasp nest removal than attempt it yourself. A wasp nest is normally only a problem if it is built near or in a home. Wasps normally look for a place to nest with good access like a crack in a wall or under roof eaves. To prevent wasps from nesting in your property good maintenance is crucial. Make sure that all gaps or vents are kept small and narrow.This will greatly reduce the likelihood of wasps entering and nesting. Wasps also like garages and garden sheds as they can normally build a nest undisturbed. To prevent a nest in your property, ensure that these areas are kept clean and tidy. In spring keep checking these areas to help deter any wasps from nest building. If you are concerned about a Wasp Nest or suspect you have an issue, in or near, your property, then we are here to help. Please get in touch, and we will be happy to carry out a free of charge inspection and advise on the best approach to take. Our wasp nest removal service is fully guaranteed so by calling us you can be sure your wasp problems will be quickly and professionally resolved. If you think that you have a problem with wasps then get in touch with us for a free, no obligation quote.